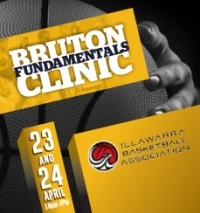 From west to east, the Black Pearl is heading over to Illawarra to host his Australian wide 'Fundamentals' clinic. Don't miss out on your opportunity to learn from NBL hall of famer and one of Australia's best basketball player and coach. There will be one on one, two on two and three on three half court games as well as skills development on the fundamentals of the game such as ball handling, footwork and shooting. The clinic will be held on Tuesday April 23rd and Wednesday April 24th from 10am - 3pm for ages 10-18 at Beaton Park Stadium “The Snakepit” 37 Foley Street, Gwynneville. Cost is $100 per registrant. This is an all day event for 2 days please ensure you bring water, packed lunch and a basketball.